The RITA (Research and Innovative Technology Administration) Bureau of Transportation Statistics reports that "during the Christmas/New Year Holiday [air travel] rises by 23 percent." As millions are stuffed into into airplanes and weather conditions change flight schedules problems for passengers escalate. Believe it or not, the right attitude and a solid plan can alleviate most travel frustrations, read these tips and become a holiday-travel expert—happy flying! 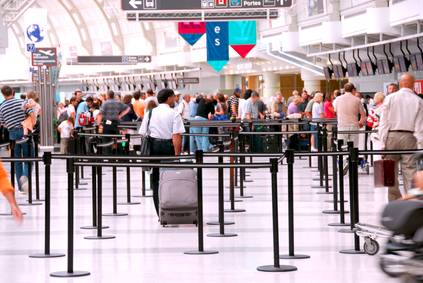 Avoid major airports during holiday season by using alternative less-traveled airports. For example, if you're considering heading to LAX look into flights out of Santa Barbara or Long Beach. CNN suggests planning flights strategically. Choose early-morning flights during the middle of the week Tuesday through Thursday for the best deals and less crowds. "Leisure travelers tend to fly on or right before or after weekends — often trying to stretch their vacations by booking post-work-hours departures and later-in-the-day returns," The CNN article states. "Business travelers tend to fly on Monday, to get a start on the business week, and Friday, to get home for the weekend. Hence, early morning midweek flights are cheaper, less crowded and have better on-time departure records." Know the airport(s) you're traveling through. Look at maps before you get to the airport. If you're driving, know where parking lots are and how to access shuttles. If you're getting dropped off, look to see where the entrances to your gate are so you don't become the car making crazy turns, nearly missing your exit and crashing over safety poles like removable bollards and cement dividers. Once you strategize getting to the airport, research ways to simplify checking in and security lines. Complaining about how long the security-check line won't make it go any faster. You are just going to frustrate yourself and annoy the people around you. Ship luggage and gifts before you leave. Skip the hassle of bag-check and avoid the possibility of lost holiday gifts and personal items. Check in online an hour to 24 hours before your flight is scheduled to leave and print your ticket at home. Use E-boarding to check in from your smartphone and use the digital barcode to get through the airport. Keep IDs and tickets easily accessible. If you're bringing a 2-year-old who will be riding on your lap, bring a copy of their birth certificate to prove age. Follow TSA rules and guidelines! Don't try to bring things on a plane you are advised not to. Airports and airplanes are exposed to so many germs! Bring hand sanitizer and take immune boosters like vitamin C and Echinacea. When traveling for the holidays there is a high possibility that something will go wrong. It's a true miracle if everything goes right—so expect for the unexpected. Check flight delays and weather conditions in connecting airports before you leave to get a good idea of what your flight situation is like. Give flight numbers to the people you are meeting so they can check your progress. Canceled and delayed flights, gate changes: pay attention to announcements being made. Pack your essentials and valuables like toiletries, medications and jewelry in a carry on. If you miss a late flight chances are you will be sleeping at an airport or local hotel. If your luggage is misplaced or lost, having valuables with you will ease the anxiety of having them stolen. Congratulations RM Bulseco! Thank you so much for taking the time to share this exciting information.